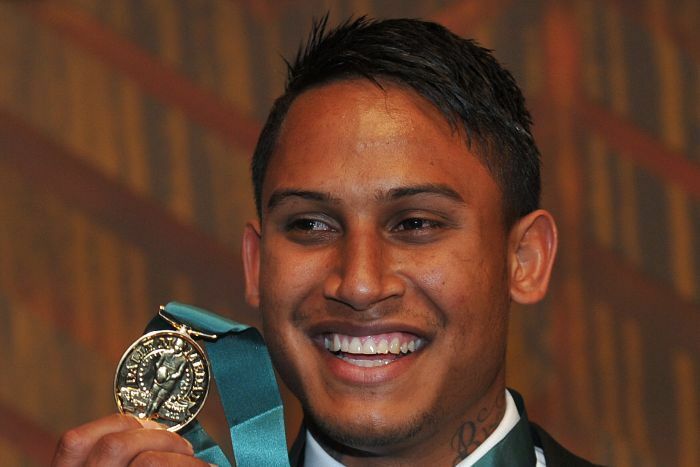 Ben Barba has been sacked by the North Queensland Cowboys before he playing a single NRL match for the club. His dismissal, announced on Friday evening, relates to an alleged incident at the Townsville casino. The Cowboys issued a brief statement that said Barba’s contract was terminated after he significantly breached the terms of his deal. “When a player joins the North Queensland Cowboys he agrees to abide by the terms of the contract,” chairman Laurence Lancini said. Details of the alleged incident are yet to emerge, but the Cowboys have referred it to the NRL’s Integrity Unit. Barba has a troubled history and his career began to unravel in the season after he won the Dally M Medal in 2012. He made his NRL debut for the Bulldogs in July 2008 and the next year he was involved in a drunken brawl with two team-mates in the carpark of a western Sydney pub. By 2012 he became the top try-scorer in the NRL with 22 from 27 matches and was judged as the league’s best player, for which he was awarded the Dally M.
But by February 2013 he was stood down indefinitely by the Bulldogs due to his off-field behaviour. The star full-back was said to be struggling with the breakdown of his relationship with his long-term girlfriend. Then Bulldogs chief executive Todd Greenberg identified alcohol and gambling among a multitude of personal issues troubling Barba. After going to a treatment facility, he returned to training and played in the fourth round of the 2013 competition. Before the season ended, he pushed for a move to Brisbane and wanted to be released from the final two years of his contract with the Bulldogs. The shift north was confirmed in August, but the next month reports emerged that he had punched a woman in the face. After a poor 2014 season with Brisbane, coach Wayne Bennett told Barba he was not wanted at the club in 2015 and he moved to the Cronulla Sharks. Barba returned to form in 2016, scoring 16 tries as a key player in Cronulla’s maiden premiership win. He was released from the club and accepted a two-and-a-half-year deal offered by French rugby union club Toulon. Barba had planned on spending the second half of the French Top 14 season with Toulon before returning to the NRL mid-year after serving a 12-month suspension for illicit drug use. But the NRL said he could not start serving that ban until he returned to Australia.